PRINCETON, NJ -- About seven in 10 Americans, including a majority of those making more than $24,000 a year, say they have enough money to do what they need to do. However, it is not until Americans reach $48,000 a year in annual income that a majority say they can handle a substantial purchase or unexpected major expense. 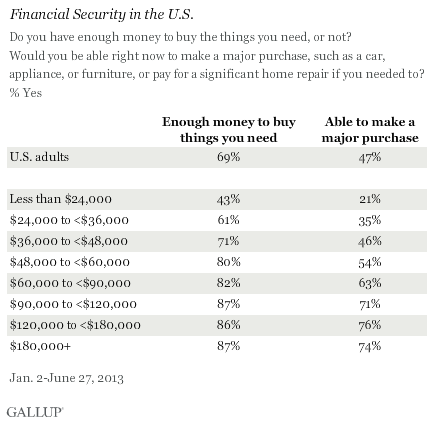 These results, from an analysis of several questions measuring attitudes toward finances and spending included in Gallup Daily tracking surveys in 2013, suggest that Americans reach various thresholds of financial security as their income increases. It seems most income groups are not suffering daily financial deprivations on a routine basis, the only exception being very low-income Americans. Less than half of Americans making less than $48,000 a year have enough of a financial cushion to handle an emergency. The threshold of financial security rises still higher when it comes to feeling good about the amount of money Americans have to spend. Overall, a majority of Americans do not report feeling "good these days" about the amount of money they have to spend until income levels reach the $60,000-a-year category. The overall range by income varies from 34% in the lowest income category to 62% in the highest. The income threshold at which a majority of Americans say they have more than enough money to do what they want to do is very high -- those making $180,000 a year or more. 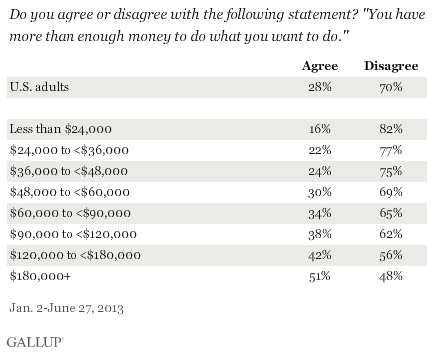 And even among this high-income group, only a bare majority of 51% say they have more than enough money to do what they want to do. Thus, it appears that relatively few Americans are so comfortable with their financial situation that they are willing to admit that they have more than enough money. And this, perhaps, is an indication that human beings manage to find ways of adjusting their spending upward to whatever their income level might be and imagine ways of spending more if they had it. Despite the evidence that many Americans are not equipped for a financial emergency and do not feel good about their finances, relatively few report worrying about money or spending on a regular basis. 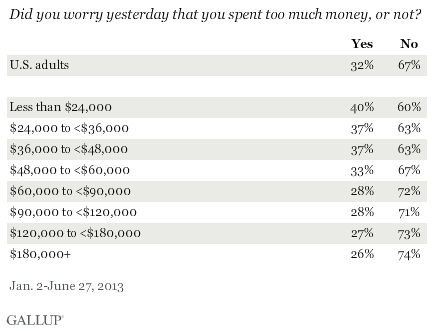 Thirty-two percent say they worried they spent too much money "yesterday" -- that is, the day before they were interviewed. This reaches a high of 40% among the lowest income group, meaning that a significant majority of Americans in all income groups go through each day without worrying about what they spent. In fact, worry about spending is constant across income groups, with even more than a quarter of those making $180,000 a year or more saying that they worried yesterday about their spending. 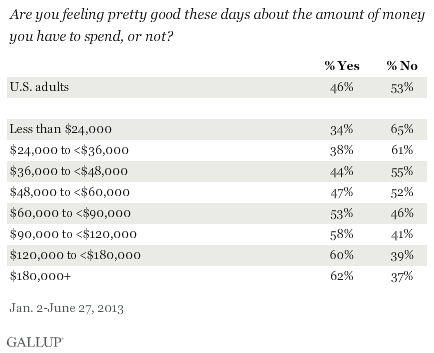 Americans' attitudes toward money and their concern about spending are complex. Most Americans are getting by financially and do not worry about what they are spending on a daily basis, but a majority do not have much of a financial cushion for emergencies. Less than half feel "good" about the amount of money they have to spend, and relatively few can do what they would want to do financially. As would be expected, Americans generally become more positive about their finances and spending as their income rises. A majority of those making $24,000 a year or more have enough money to buy needed things on a daily basis. But, more than half of those making less than $48,000 a year say they could not handle a financial emergency, and more than half of those making less than $60,000 a year say they do not feel good about the money they have to spend. A substantial majority of Americans in all but the highest income categories say they do not have more than enough money to do what they would want to do. These results are based on telephone interviews conducted Jan. 2-June 27, 2013, on the Gallup Daily tracking survey, with a random samples of between 21,958 and 22,159 adults, aged 18 and older, living in all 50 U.S. states and the District of Columbia. The margin of sampling error for each income subgroup varies from ±4 percentage points to ±2 percentage points, depending on the subgroup's size. Americans' self-reported daily spending averaged $90 in June, unchanged from May. Upper-income spending was $143 in June, not much different from the $150 in May or April's $140.